Alice Grace Ripley lives in a dream world, her nose stuck in a book. But the happily-ever-after life she's planned on suddenly falls apart when her boyfriend, Gordon, breaks up with her, accusing her of living in a world of fiction instead of the real world. Then to top it off, Alice loses her beloved job at the library because of cutbacks due to the Great Depression. Fleeing small-town gossip, Alice heads to the mountains of eastern Kentucky to deliver five boxes of donated books to a library in the tiny coal-mining village of Acorn. Dropped off by her relatives, Alice volunteers to stay for two weeks to help the librarian, Leslie McDougal. But the librarian turns out to be far different than she anticipated--not to mention the four lady librarians who travel to the remote homes to deliver the much-desired books. When Alice is trapped in Acorn against her will, she soon finds that real-life adventure and mystery--and especially romance--are far better than her humble dreams could have imagined. 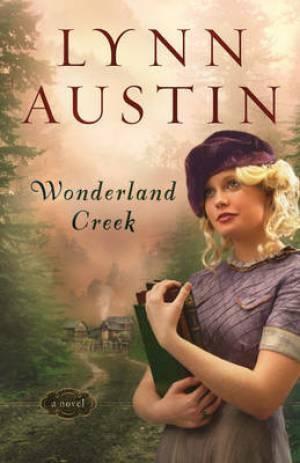 Wonderland Creek by Lynn Austin was published by Baker in November 2011 and is our 19418th best seller. The ISBN for Wonderland Creek is 9780764204982. Alice is a much-indulged 22-year-old librarian and minister?s daughter, always more absorbed in books than in the world around her. Suddenly losing both beau and job, she opts to personally deliver the books she?s collected for a small town in Kentucky. The place isn?t at all what she expected, and soon Alice is living large and learning a great deal about herself and her faith. Set in 1936, six-time Christy Award winner Austin?s charmingly candid, wryly self-deprecating, first-person inspirational novel showcases her ability to make history?especially the New Deal workforce projects, the Civilian Conservation Corps, and the WPA?more than drily factual. Austin succeeds in combining suspense, romance, and an insider?s perspective on one isolated, close-knit Appalachian community and the packhorse librarians who served it so faithfully. Readers who enjoyed her WWII novel, While We?re Far Apart (2010), will find this one much lighter in tone, though in its coming-of-age narrative, Austin explores many of the same themes, including family, the challenge of living a godly life in an ungodly world, and service to others. Got a question? No problem! Just click here to ask us about Wonderland Creek.